Sculptra is a biocompatible, resorbable injectable product composed of poly-L-lactic acid (PLLA). It falls in the class of a stimulatory product that creates its effect through encouraging neocollagenesis when injected. As it differs from traditional, static dermal fillers such as hyaluronic acid and collagen, as a stimulatory product it causes the growth of fibrous tissue or collagen within the body, which then results in volume restoration gradually. Sculptra is used on most parts of the face (except on the forehead and above the lips). Common areas of use include cheeks, temples, inframalar region, chin, prejowl sulcus, and marionette lines. Sculptra is suitable for both women and men of different ages. It can help with deep folds around the mouth and nose, sunken cheeks, facial scars, deep acne scars and loose skin. Our surgeon will be able to assess your suitability for the Sculptra treatment. Treatment effects will differ for each person. In a clinical study, the treatment results lasted for up to 3 years after the first treatment session, in most patients. Touch-up treatments may be needed to maintain the desired effect. Immediate side effects may include injection-related events at the site of injection, such as minimum redness, slight tenderness or discomfort, some bruising and rarely swelling. A delayed appearance of small bumps under the skin in the treated area could rarely occur. Generally these bumps are not visible and may only be noticed when pressing on the treated area. 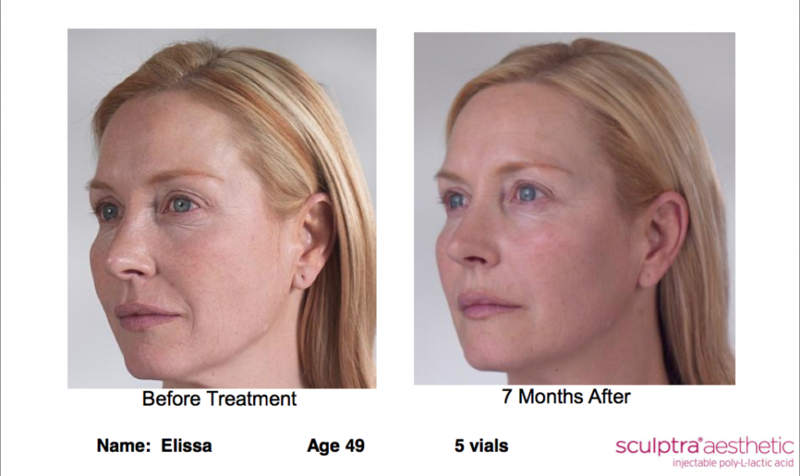 How is Sculptra treatment performed? The treatment consists of the product being injected deep into the fatty tissue of the face. It is uncomfortable rather than painful and the session lasts about half an hour. No, skin testing is not required prior to use. No. After the first treatment, it may appear that Sculptra worked immediately. Typically, patients will experience some degree of edema associated with the injection procedure, which will give the appearance of a full correction by the end of the injection session (within about 30 minutes). Each patient should be evaluated individually. More than one treatment session may be required. Patients with severe facial fat loss may require 3 to 6 treatment sessions. Sculptra works by stimulating the build-up of your body’s own collagen to get rid of lines and wrinkles and restore a more youthful appearance but with gradual, natural looking results. Sculptra requires planning over 12 – 16 weeks as 3 treatment sessions are usually needed with a minimum interval of 2-3 weeks between each Sculptra session. Final results are at 6 – 10 months. Younger patients starting in their twenties report changes at 3 – 4 months, often after their first treatment. Are skin tests required before treatment with Sculptra? No. After the first treatment, it may appear that Sculptra worked immediately. Typically, patients will experience some degree of oedema associated with the injection procedure, which will give the appearance of a full correction by the end of the injection session (within about 30 minutes). How quickly can my patients return to their daily activities? Most patients feel comfortable going back to their normal activities following the Sculptra treatment.